What type of Insect do I have? There are several species of concealed nesting yellow jackets. 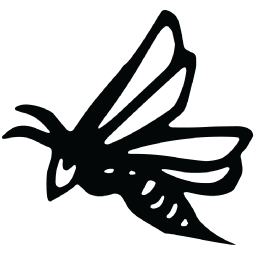 At least six species live in our area, the most common being Vespula alascensis (the common yellowjacket) and Vespula pennsylvanica (the western yellowjacket). These yellow jackets all share the classic yellow and black pattern. The two species of hornet we have around here are Dolichovespula maculata, the black and white “bald faced hornet” and Dolichovespula arenaria, also known as the aerial yellowjacket or yellow hornet. Both species build the characteristic large, hanging paper ball nest. 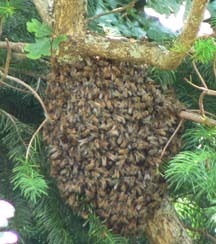 We will gladly come remove your hornet nests free of charge, without the use of chemicals! These nests are worth our time to collect once they have reached the size of a softball or larger. Wasps of the genus Polistes are the most common type of paper wasp in North America. The European paper wasp, Polistes dominulus, was introduced into the US in the early 1980’s and has quickly spread throughout most of the country. It is the most prevalent wasp that we find in our area. The western honeybee, Apis mellifera, is the most common species of honeybee worldwide. They are eusocial, creating perennial colonies with a single fertile female (the queen), many non-fertilized females (the workers), and a small population of males (the drones). 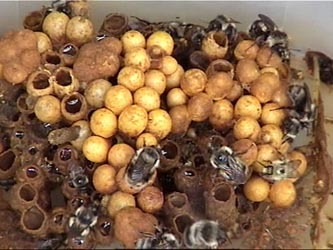 Individual colonies can house many tens of thousands of bees. Bumblebees belong to the genus Bombus within the family Apidae. There are over 50 species found in North America. Bumblebees have round bodies covered in soft hair, making them appear and feel fuzzy. Like their relatives the honeybees, bumblebees feed on nectar, using their long hairy tongues to lap up the liquid. They generally ignore humans and other animals and unless disturbed, most bumblebee species are not aggressive in defending their nest. Habitat loss, pesticide use, and the mechanization of agriculture have all contributed to the decline of these invaluable native pollinators. We do not remove bumblebees and very much discourage folks from destroying their colonies. Please just give them a bit of space and allow them to complete their relatively short annual life cycle. 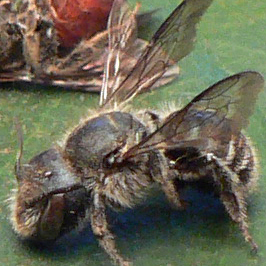 There are several species of solitary bees most of which nest in the ground. 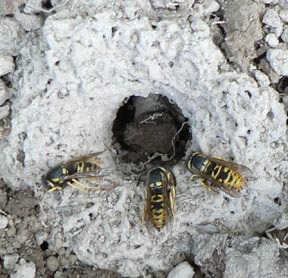 You can tell solitary bees from yellow jackets in the ground by the entrance hole to their nests. 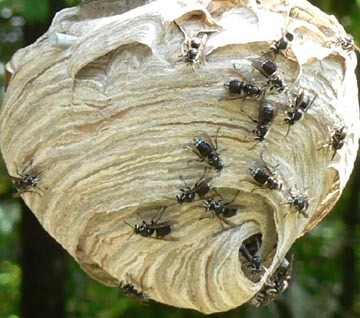 Yellow jackets will generally have one hole that they use to come and go from. Solitary bees nest sites will have many holes (they look like worm holes). Some are gregarious nesters with 100s, sometimes 1000s, nesting in the same area of ground.